August 29, 2016 August 27, 2018 - by Ed Perrone - 5 Comments. 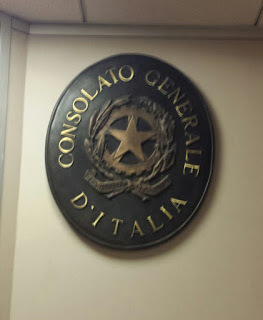 Today I had my appointment at the Italian consulate in Houston to present my documentation to claim my Italian citizenship. It went far better than I could have expected. A minute or two after 9:00 they unlocked the door. I was the first one in. I signed in on the sign-in sheet, and was directed to window #3 — a bank teller-like window, but with two comfortable chairs to sit on. You pass your documents through a little slot in the plexiglass divider. A few moments later, a fairly cheerful-looking lady arrived, said “Buongiorno,” asked me how I was doing, and then pretty much got down to business. I found out later her name is Valentina, but she did not introduce herself at this time. She first asked for my passport and my driver’s license or other proof of residence, which I gave her. She then asked for Form 1, which is the basic application and details the line through which I am claiming. She looked that over, then asked me for the $339 fee, which I gave her in cash in the exact amount. She also had me sign Form 1 for her. She excused herself for a moment, and said she would return with my receipt. She brought my documents with her and, I presume, made copies of them. She returned in a few moments and gave me a copy of Form 1 with the receipt stamped on it, as well as my passport and license. Then we got down to the nitty-gritty. My line is my grandfather, to my father, to me. So she asked for my grandfather’s birth certificate. She examined it briefly, then asked for his naturalization papers. This is where I had the most worries. I had the NARA documents which provide all the basics of the naturalization, including the court order and certificate number. But I have not yet received the actual naturalization certificate from USCIS (which I ordered in April!). I was hoping this would not be too serious of a problem. I gave her the NARA documents, which she examined approvingly. I noted her nodding her head as she was going through these documents, and I took that to be an encouraging sign. As long as she is nodding, I figured, I am good. Then she asked for the naturalization certificate. I told her that I had not yet received it, although I had ordered it in April. She said — to my immense relief and surprise — that that would not be a problem. For the “completeness of my file,” she asked that I forward it to her when I receive it. But she said it was “not necessary” to have it in order to proceed. She then asked if I had my grandmother’s birth certificate. I did, and I gave it to her. She asked if my grandparents were married in Italy or here. I told her they were married here, and slid the marriage certificate through the slot. She examined the certificate, comparing the names to the birth certificates. She then looked at the translation, comparing that to the original certificate. All the while, she was nodding her head. I was breathing a little easier. Next was my father’s birth certificate. Then his marriage certificate and my mother’s birth certificate. Again, she compared everything to the previous certificates, and compared the translations to the originals. Again, I noticed her nodding to herself a few times through the process. Then she commented to me that she was very pleased with the Delaware marriage certificates — both my parents and my grandparents had been married in Delaware. She said these marriage certificates provided all the information about the bride and groom, including their parents’ names and places of birth. She said many certificates simply said that “so-and-so married so-and-so,” without providing any other details — and it is those details that she needs in order to verify that the correct people are being married. She then asked if my father was still alive. I said no, so she asked for his death certificate, which I gave her. Then it was my documents: birth certificate and marriage certificate, which I provided her. I was married in New Hampshire and they, too, include the information about the parents of the bride and groom. Again, she compared things to the previous certificates and nodded her head a few times. She asked if I had my wife’s birth certificate. I did, and gave it to her. She said she wanted this because the marriage certificate only said my wife had been born in “Maine,” but to properly complete their forms, they needed the city of her birth as well. At this point, she told me that everything seemed to be in order. She repeated that she would need the naturalization certificate to complete my file, but that she could actually process everything without it. Then she asked for the remaining forms: Form 2 (my declaration that I have never renounced Italian citizenship) and Form 4 (the declaration of deceased ascendants). I gave her Form 2. She looked it over, returned it to me to sign, then I returned it to her. I then gave her Form 4 for my grandfather. She looked at it for a moment, then told me that she didn’t really need it. My grandfather, she said, lost his Italian citizenship when he became a U.S. citizen. The Italian government already knew that, and did not need to verify that he did not renounce it. She made a distinction between “losing” his citizenship by naturalizing in the U.S. and “renouncing” his citizenship formally — apparently this is an important legal distinction in Italian law. So she gave me back that form and said I did not even need to submit it. Then I gave her the Form 4 for my father. She examined it, I signed it, and gave it back to her. Finally, the AIRE registry form. Again, she looked it over, filled in “Giusvalla” (my grandfather’s birthplace) as the comune of reference (i.e., the town where all of my paperwork will be filed), and had me sign it. I tried to control my ecstasy…. She said my documents were “perfect.” Seriously, that is the word she used. She said it’s surprising how many people show up with bad documents, incorrect documents, incomplete documents. I was lacking the naturalization certificate, but that didn’t seem to bother her. She mentioned that my line was fairly straightforward, “but even so…” she said. Moral of the story: Make sure your documents are in order. It will make you stand out in a good way. to send in the naturalization certificate when I received it. And then, about a half-hour after we started, we were done. I am extremely fortunate. I only discovered I am entitled to Italian citizenship last November 30th. It is now nine months later and I am basically approved. Within another month, approval should be official, and maybe another month after that and I will have a passport. Less than a year from start to finish. There are people for whom this process takes years — two years simply to get an appointment, another two years’ wait while the authorities process the request. That is in the U.S. In South America, the situation is far worse, requiring 10-20 years — you read that correctly — to go through the process. A process of claiming what is rightfully yours by birth. Not asking for something new, but simply claiming something you already have. I am a very fortunate guy…. I am not fortunate alone, however. I need to thank Audra de Falco for her accurate translations of my documents. The Dual U.S.-Italian Citizenship group on Facebook for all kinds of help and support throughout the process. And Avepally on Fiverr for quickly and inexpensively obtaining my grandmother’s birth certificate from Italy when I was unable to do so. Next Article E’ ufficiale: Sono cittadino d’Italia! How great is it to finally be able to say "Sono Italiano!" ? Hi, my Houston appointment is in February and I'm seeking through my GGF. May I ask you a couple of questions? 1) on the consulate application, do I need to complete all sections (GGF, GF, F, & all maternal, as well)? Or just some portion? 2) Do I need Form four for my GGF, my US born GF and F? (My GGF never naturalized, and I've got the certified documentation for that, I'm just curious about the form 4 for my deceased GF & F.
I feel a little silly not being able to figure this out, as I fill out legal documents for a living. Any help GREATLY appreciated! Hi, Mary, good luck on your appointment! On your questions: For Form 1, I completed the sections for everybody — GF, GM, F, M. Don't know for sure if we "have to," but I figured it wouldn't hurt. 🙂 For Form 4, you need one for everyone in your direct line: GGF, GF, F. The reason is that, if any of them renounced their Italian citizenship, then it might break the line of transmission. So the consulate needs to verify that none of them formally renounced. Hi again. I found your question about the AIRE form on the FB dual citizenship page, and I see you posted a similar question and I now have my answer to that!